Garry not only a salesmen but a great one he made sure I did not feel pressured and gave me the best deal they had. He made sure I was satisfied with my purchase. Service Representative she was Awsome kept in touch with me and was a great people person I will shop there in the future again. 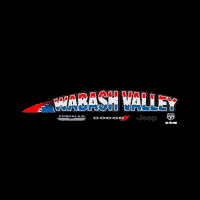 I'm from Lebanon Indiana and I found the truck I was looking for at Wabash Valley Chrysler in Wabash Indiana. Aaron Pharris my salesman. Very good experience and a great personality. I'll be back when looking for another vehicle. Thank you Aaron. Garry was a very helpful salesman. He didn't put any pressure on me to buy and was there to help when I needed assistance. I would definitely reccomend anyone looking for a new car to go and have a chat with him. My wife and I bought a very nice used car from here in November of 2016. This was the first sell for this new salesman. The salesman was wonderful to work with and he really went over and above to let us see every feature of this car, they even let us take the car overnight and most of the next day to let us see if it fit what we were looking for in a car. We bought the car. And we still love it. I will be be back when we are ready to buy again.